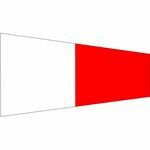 Question/Interrogative Pennant (INT) is used on warships, alone or in short sets to communicate various unclassified messages. These flags and pennants are generally used differently from the International meanings. Warships will fly the answer pennant above the signal to indicate it should be read using the International meaning.